This post is a little late due to me being swamped with pillow orders! I know, it is a good thing, but it definitely takes up a lot of my time. I've started scheduling nail time so I remember that I have other obligations as well! 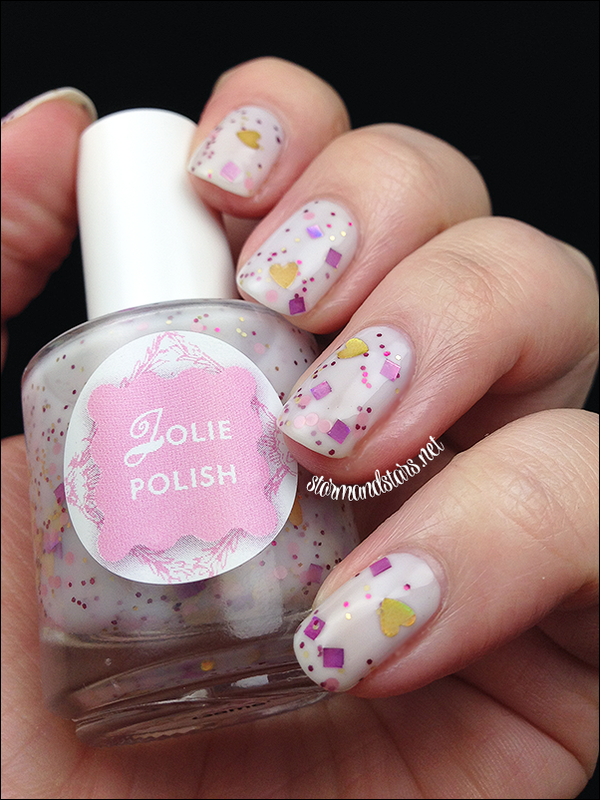 I have another beautiful collection for you today from Jolie Polish. When Bory told me she was going to send me some more pretties to review I was so excited because her polish is so gorgeous and her white crelly based glitters are the perfect consistency. This collection has 3! Shall we get right to it? 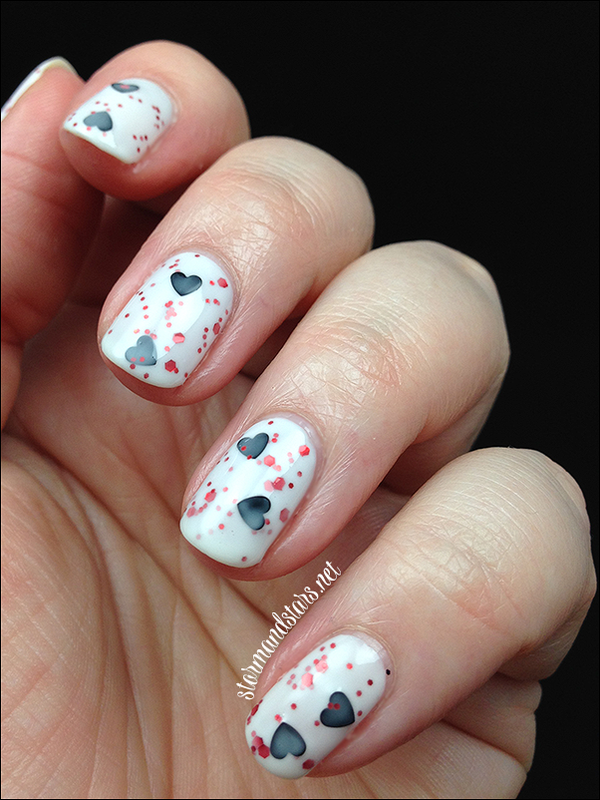 First up is one of the white crelly glitters, this is Ace of Love. How pretty is the contrast of the bold red and black against this soft white base? LOVE! 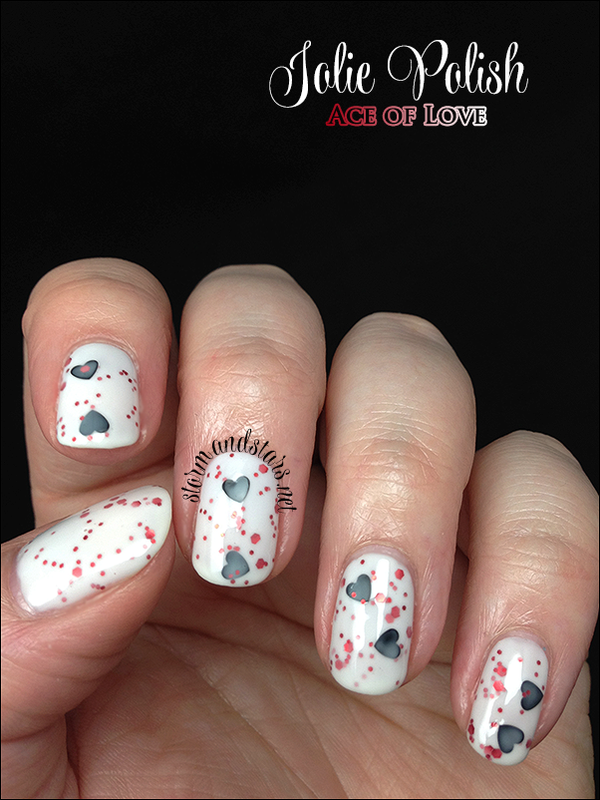 Ace of Love is a white crelly based polish with multi sized red hex glitters and black hearts throughout. I started with two coats of Jolie Polish White Crelly then added just one coat of Ace of Love plus topcoat. 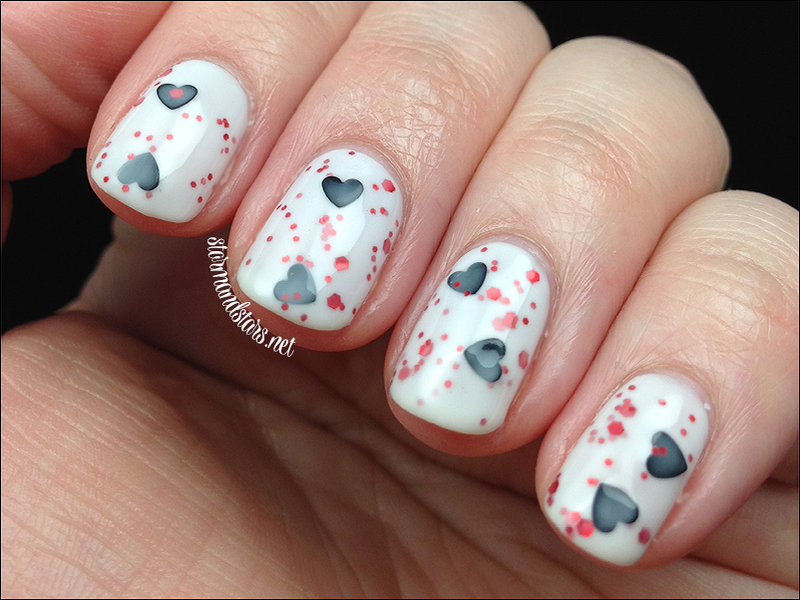 I did have to do some digging for the hearts, but that is the norm with this type of polish. Other than that, the formula is flawless. By far, my favorite of this collection is Boy Meets girl. I am such a sucker for a grey polish. This baby is no exception I am so happy with everything about this! 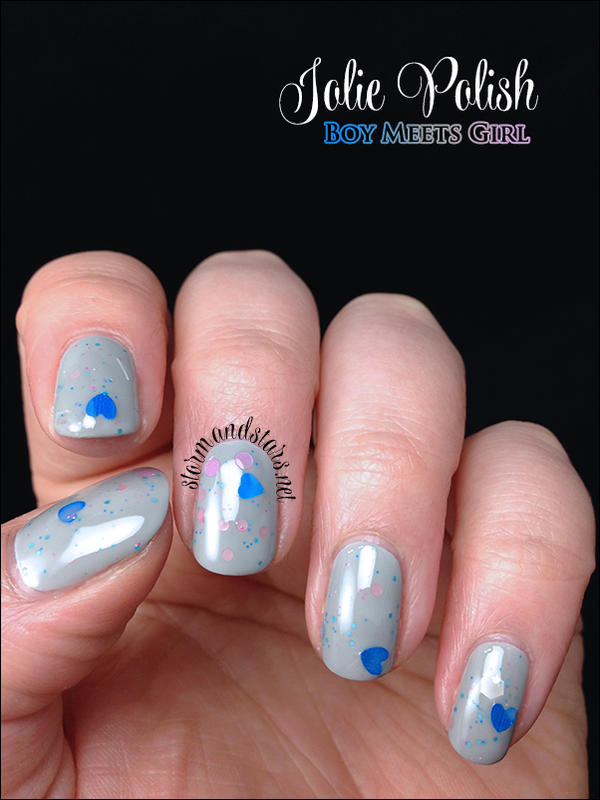 Boy Meets Girl is a grey crelly lacquer with tiny pink and blue hexes, big blue hearts, some large white hexes and medium pink circles. 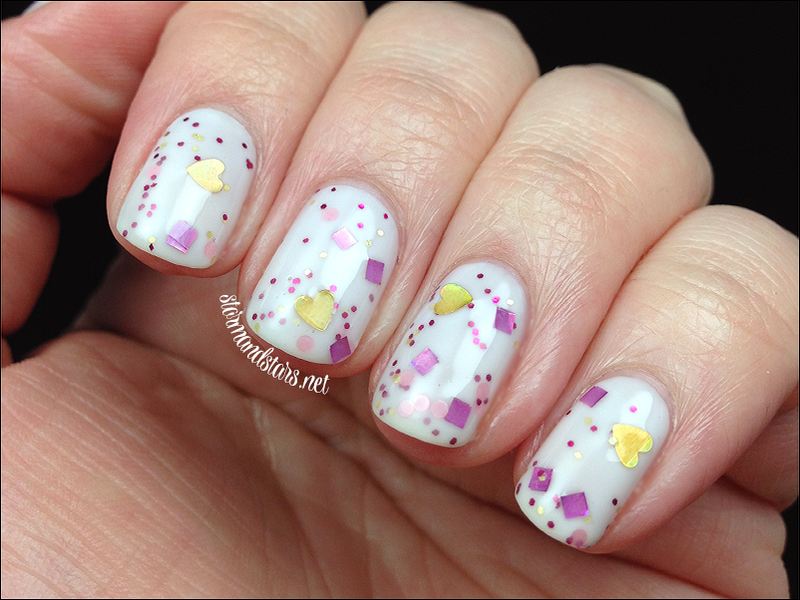 There are also a few white bar glitters in there but I only ended up with one on my nails. I used Cult Nails Faded as the undies for this and it was perfect. 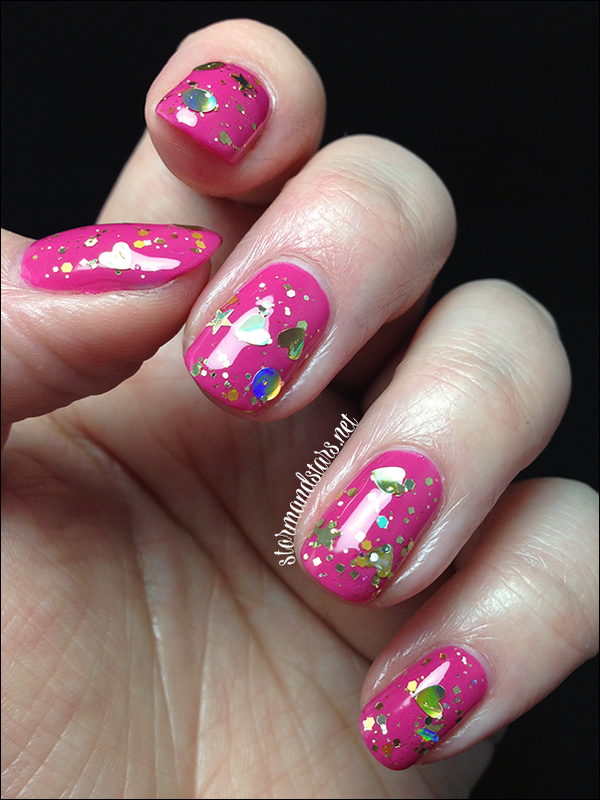 Then I added one coat of Boy Meets girl and Wicked Fast topcoat to make it shine! Once again, the formula was flawless. 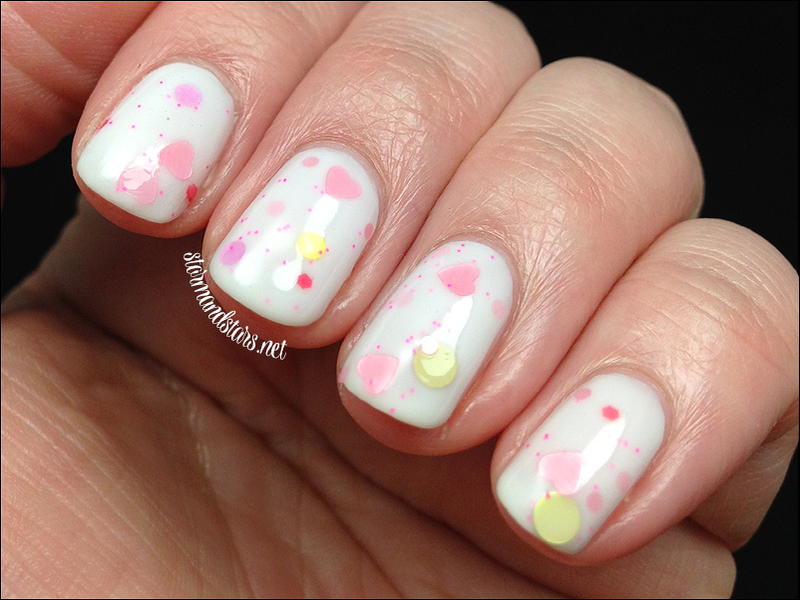 Moving on to another white based lacquer, I have Spring Love. 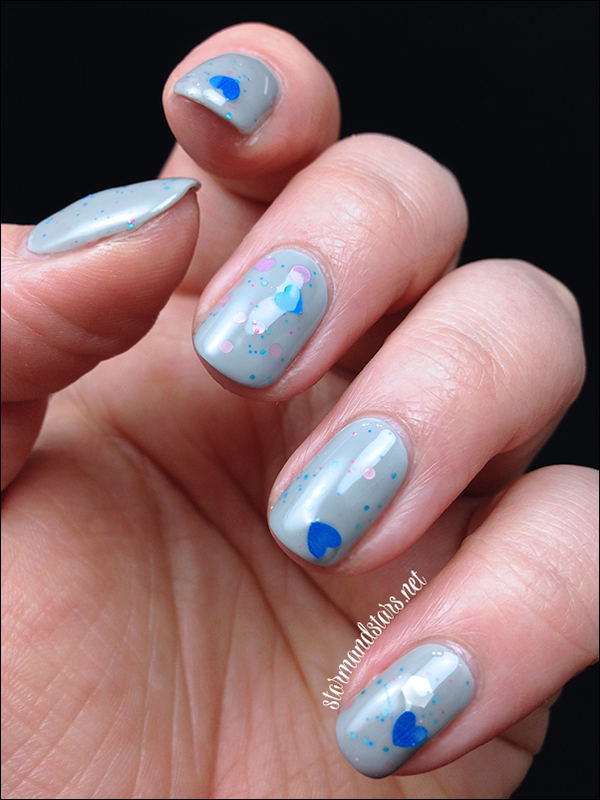 This is the polish I was most looking forward to from this collection and I was not disappointed! 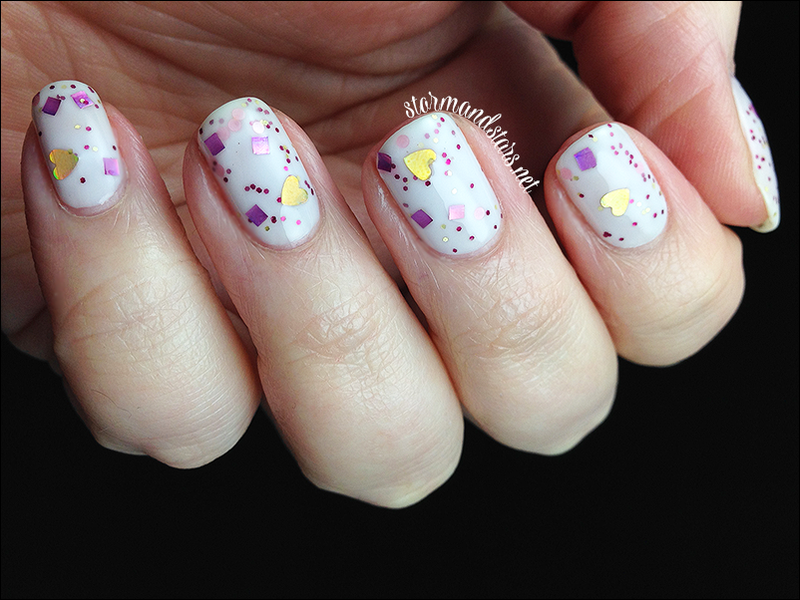 Spring Love is a white crelly based lacquer with pink hearts and hexes, darker pink hexes, medium yellow circles and large gold holo circles. I started with two coats of Jolie Polish White Crelly for the undies and then I added one coat of Spring love plus Wicked Fast topcoat to finish it off. 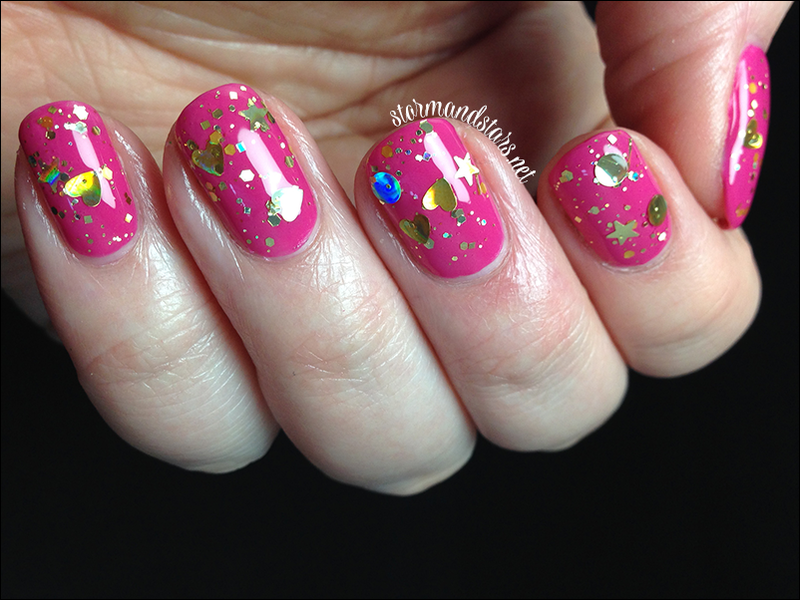 The formula was great on this, though I did have more trouble getting this larger glitters out than in the others in this collection. I'm not really sure why that is. 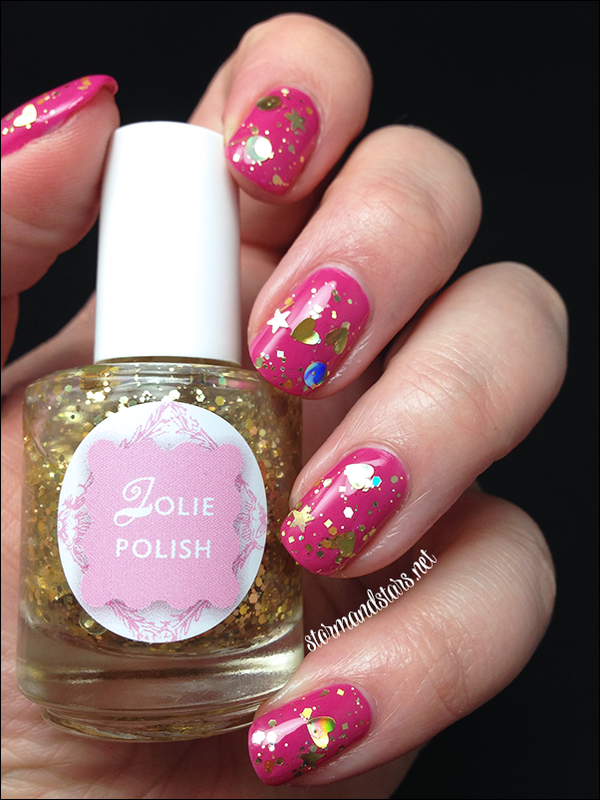 The only clear based glitter topper in the collection is Heart of Gold. 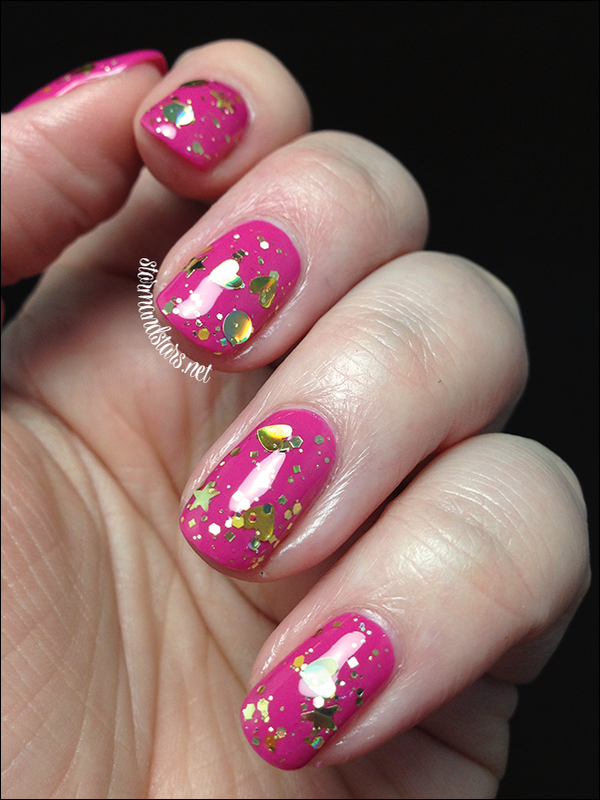 This glitter topper sparkles soooooo much! I love it a lot. 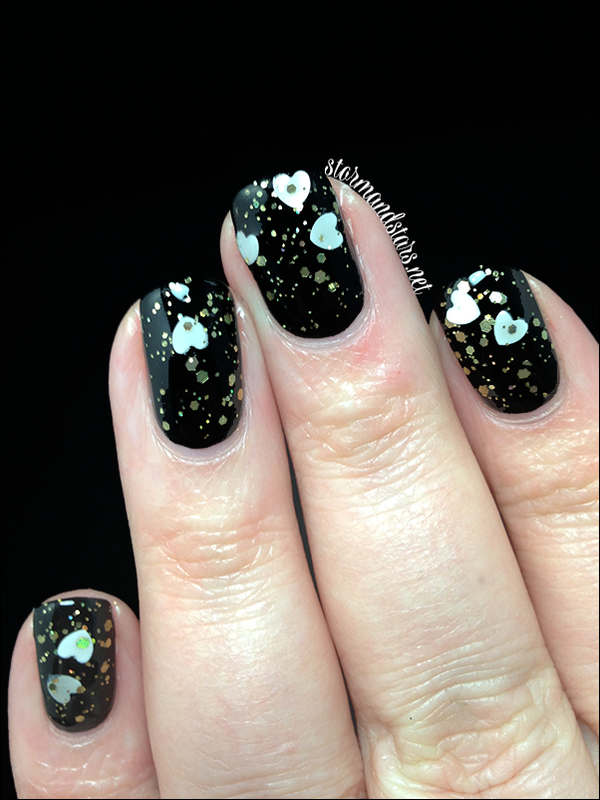 Heart of Gold is a clear based glitter topper with multi sized and shaped holorgraphic gold glitters. 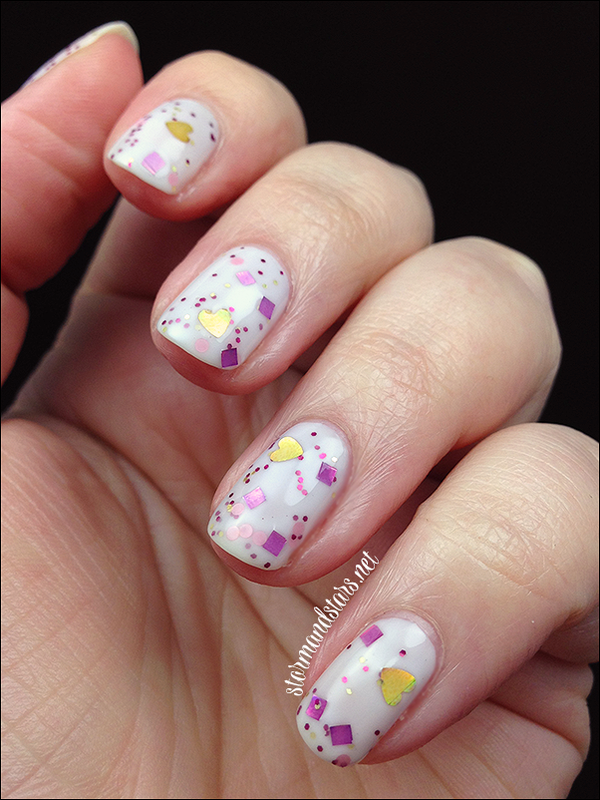 I started with two coats of Cult Nails Devious Nature for this manicure and then added two coats of Heart of Gold. I used one coat of Wicked Fast for my topcoat. Great formula and glitter payout was decent. 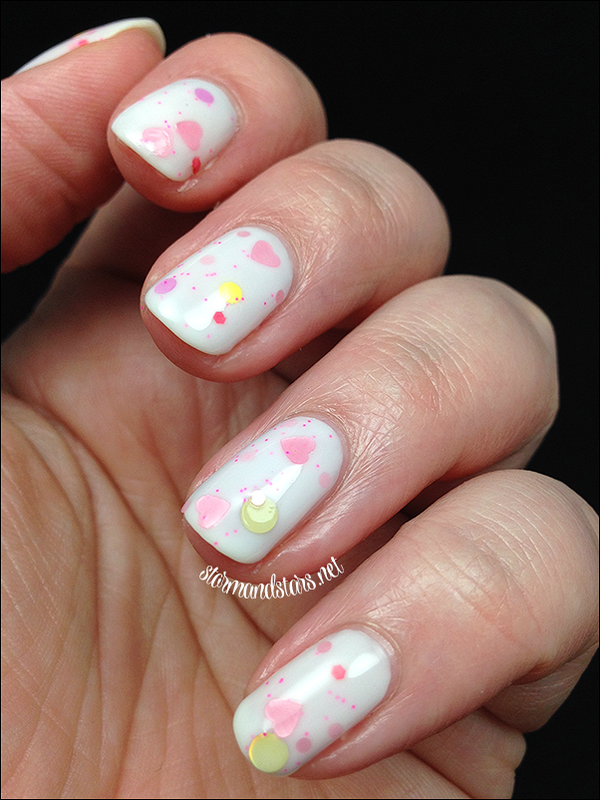 The last of the white crelly polishes in this collection is Love Game. 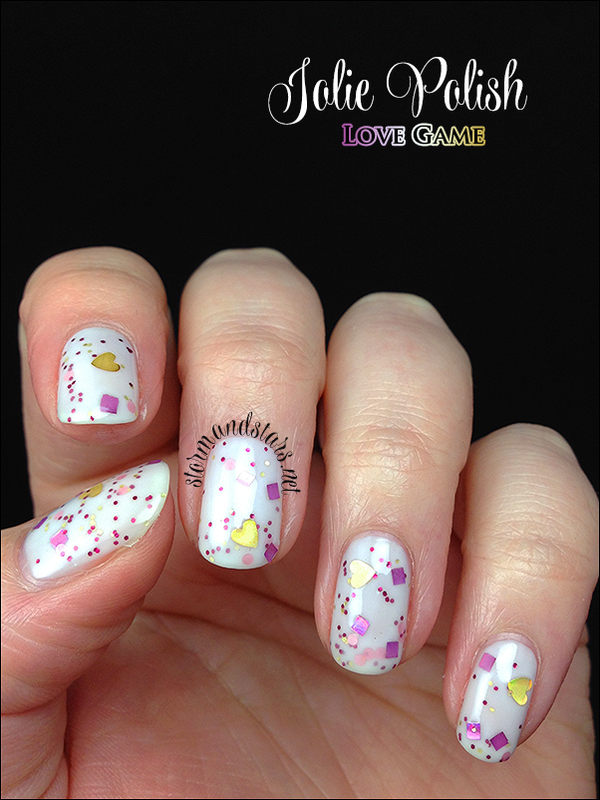 Love Game is a white crelly lacquer filled with gold holo hearts, purple squares <3<3<3, pink circles and tiny purple hexes. This is easily my second favorite in the collection. 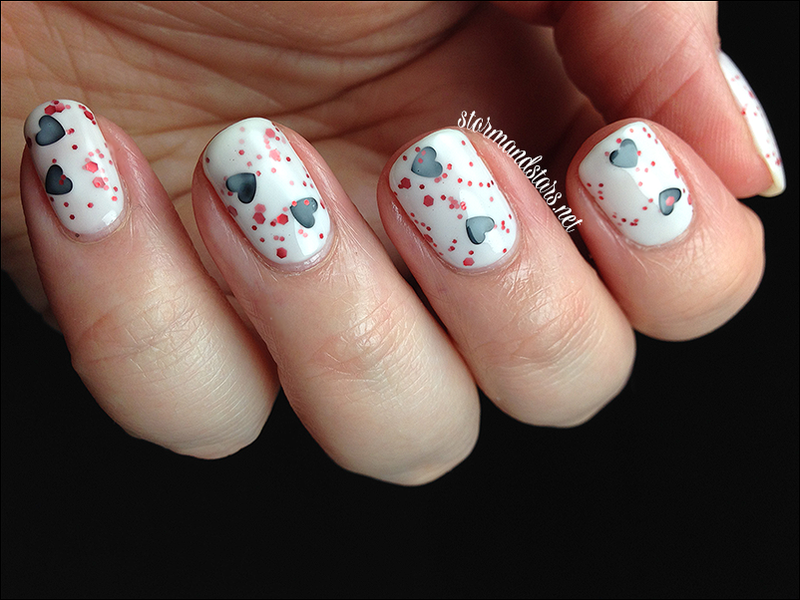 I used two coats of White Crelly to start and then one coat of Love Game on top plus Wicked Fast topcoat from Cult Nails. Again, the formula is perfect. 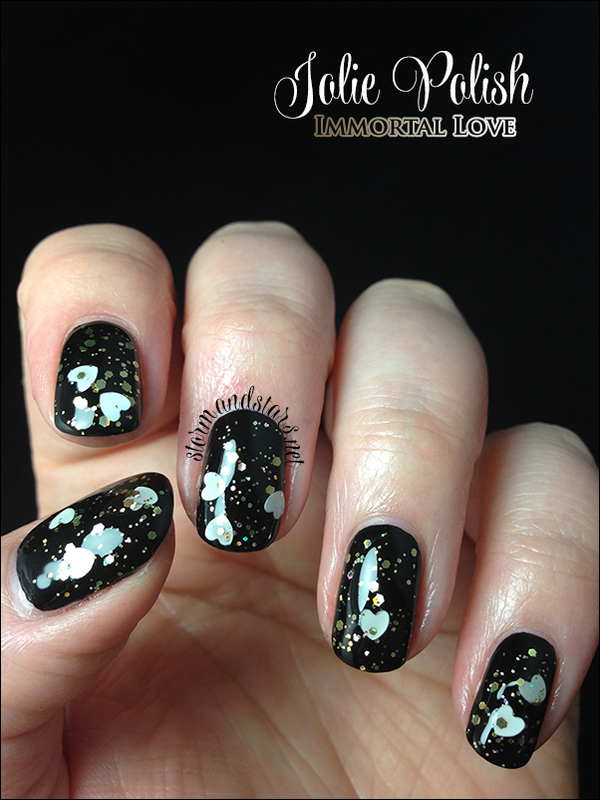 Last but certainly not least from the Heart Collection is Immortal Love, the only dark lacquer in the bunch. Look at that squishy finish!! So much love for black jellies. 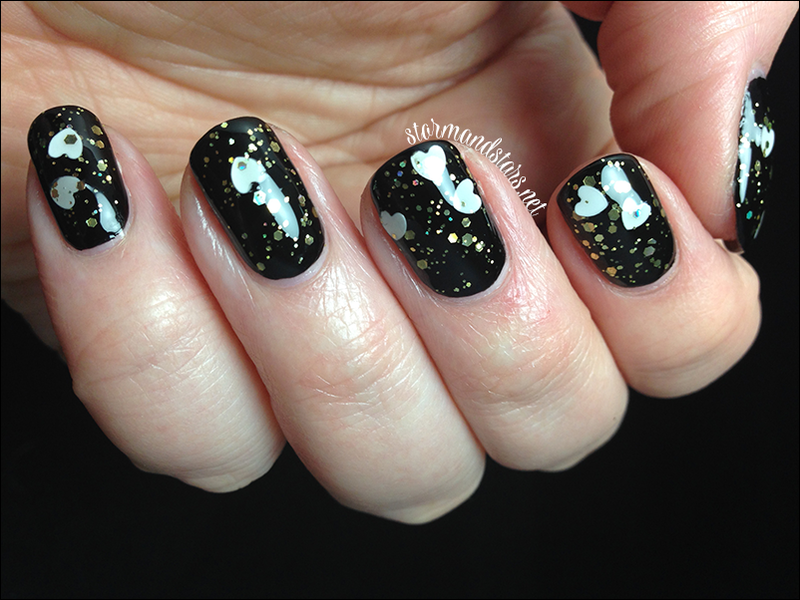 Immortal Love is a sheer black jelly lacquer with gold holo glitter and big white hearts. This is the only polish I had any trouble with and the only trouble was it was a bit sheer and needed undies. 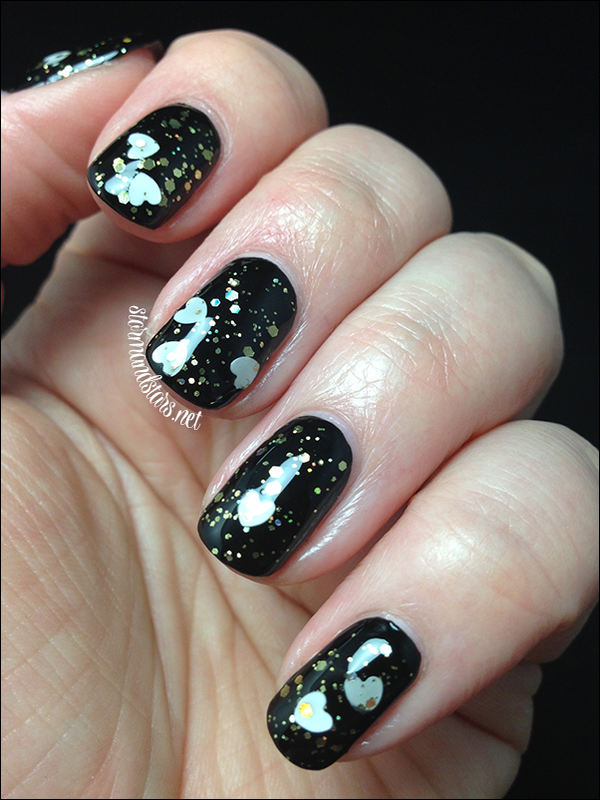 I used one coat of Milani Black Swift and two coats of Immortal Love plus Wicked Fast topcoat for these photos. 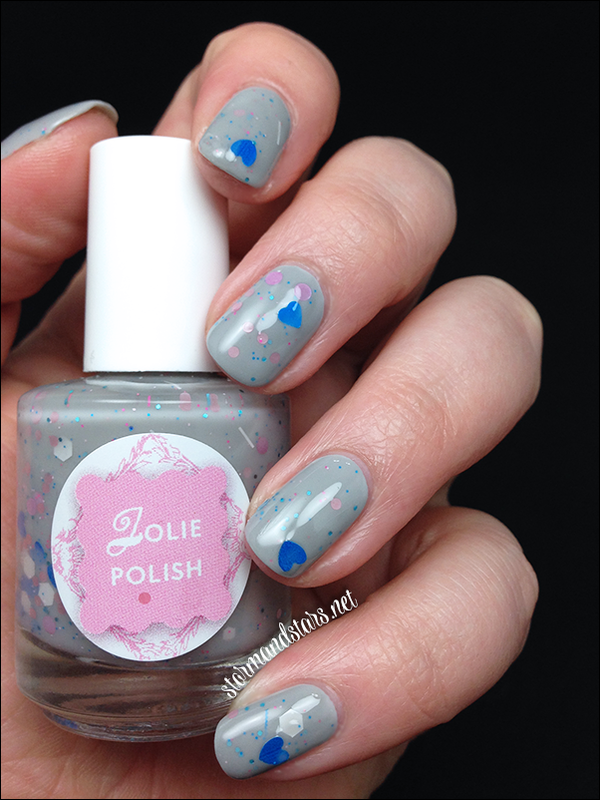 I believe Jolie Polish now has a Black Crelly polish that would make a great undie for this and make it look even more squishy! I really love this collection. Its so cohesive and simple but so perfectly pretty. There is a huge range even with there being three whites and the formulas are fantastic. 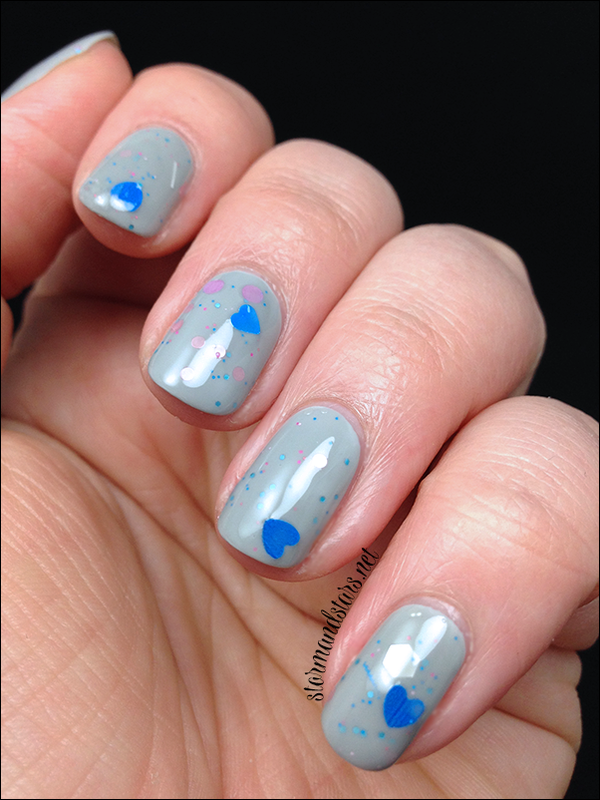 I did turn these over for a while before I swatched them to make the hearts float to the top of the bottle, so I would suggest you do the same. My picks from this collex are Boy Meets Girl, Love Game and Immortal Love, but I really love the entire collection as a whole and I highly recommend it. 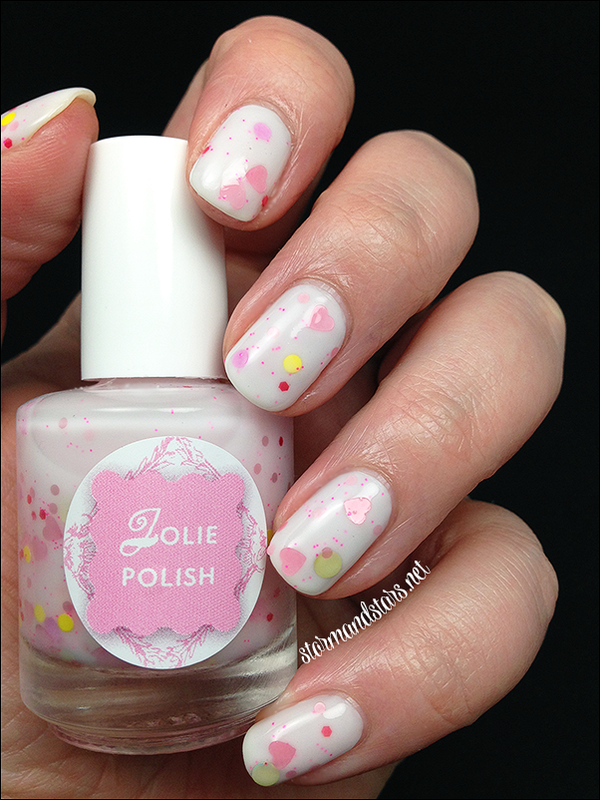 You can also follow Bory and Jolie Polish on Instagram @joliepolish for Jolie Polish news and @rinoa1107 for Bory's personal nail art. 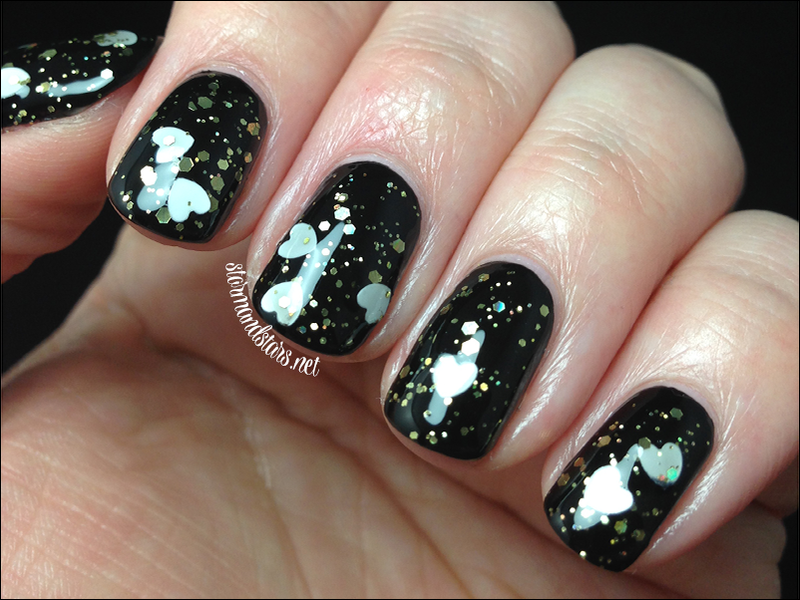 You can also follow @nailthedeal for all sorts of deals and coupon codes on polish and other beauty items! Whats Tha? Narl Art? Matte vs. Shiny!